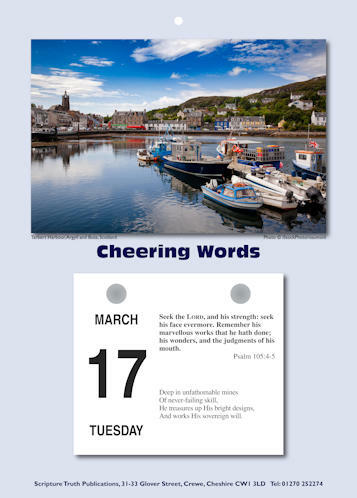 The “Cheering Words” daily tear-off calendar of Scripture readings (KJV) and relevant hymns or poems has been a familiar sight on the walls of Christians for many years. 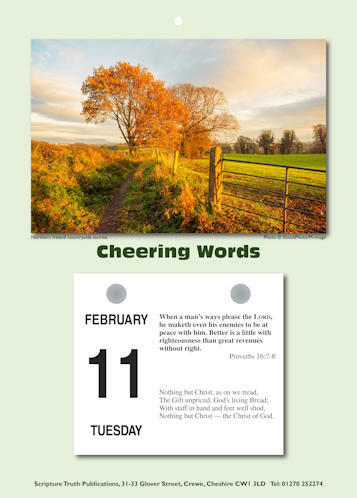 Orders can soon be placed for the 2020 Cheering Words calendar, which displays texts from the Authorized (King James) Version. [Sunday is displayed as The Lord’s Day]. For 2020 the wall calendar backs are again printed with a picture on each side, but we will supply them with the calendar block fitted to the side of your choice. You receive a calendar with both pictures: “Tarbert Harbour, Argyll & Bute, Scotland” and “Northern Ireland countryside sunrise” (see below).